Whether you’re seeking to move house, require a transport vehicle for commercial purposes, or looking for a temporary truck while your other one is being repaired, at Mobile Truck Rental, we are devoted to delivering five star Gold Coast truck hire solutions that represent the ultimate in convenience and affordability. No matter where you’re situated on the Coast, our team can organise a 3 tonne Pantech truck to be delivered directly to your address, at a time that best suits you. The biggest advantage of hiring a 3 tonne truck is that you don’t require a truck licence to drive one; anyone with a valid car licence is authorised to get behind the wheel of a 3 tonner. At Mobile Truck Rental, we know that renting a truck can be a taxing experience, particularly if you’re hiring one for the first time. For this reason, we’ve made every effort to develop a robust service that aims to ensure a stress-free vehicle rental experience. All of our trucks are kept in impeccable working order and our friendly and professional staff will provide you with all the help you need to guarantee a safe and enjoyable experience. Our fast and efficient rental application process, 5 star fleet and ultra-convenient service that does away with the need to return your vehicle to a yard once you’ve finished using it, has enabled us to steadily broaden our customer base. Whether you require a hire truck to help relocate the contents of one business location to another, or need a vehicle to transfer your personal belongings, we can customise an affordable rental solution for you that will save you time and money. The team at Mobile Truck Rental work relentlessly throughout the year to deliver AAA vehicle hire services to customers whenever they require them. We know that emergency circumstances can sometimes arise that call for a hire truck immediately and we’re only too happy to supply you with the right truck in your moment of need at an agreeable price. 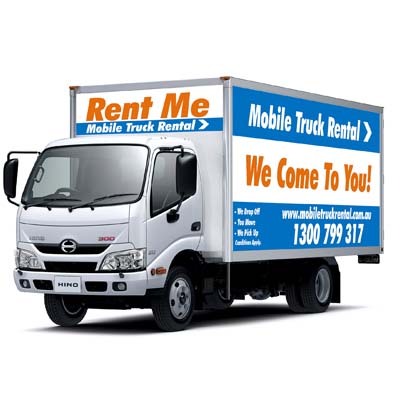 At Mobile Truck Rental, we make Gold Coast truck rental affordable. Our vehicles are all immaculately clean, well maintained, regularly serviced and come fully equipped with all the gadgets you need to perform your transport duties in total comfort. Competitive rates with no hidden charges. Moving to a New Address? Hire a Rental Truck and SAVE BIG! When you’ve made up your mind to hire a truck and relocate your personal possessions with the assistance of a mate or two, you need to be sure that you’ve selected a trustworthy rental company that has a blemish-free track record for Do-It-Yourself removals and relocations. Our 3 tonne trucks feature everything you need to get the job done safely and in a timely manner, including a trolley, rope and rear tailgate lifters. It’s no secret that removal costs in this day and age are frightfully expensive. They demand an obscene amount of money to have your possessions transferred from one location to the another. While you could opt to pay an outrageous sum of money to have a removal company relocate everything for you, the good news is, you don’t have to. Our late model rental trucks are equipped with everything you need to safely and efficiently deliver your goods to your target destination in a timely manner and without hassle. To learn more about our hire truck fleet, please refer to our truck info page. One of the biggest grievances for customers when dealing with many other truck hire agencies is their uncompromising lease terms. At Mobile Truck Rental, our staff will help you choose the right vehicle for your needs and create a cost effective contract that is just right for you. We understand that not all removal jobs are finished within a day or so, which is why we specialise in the provision of truck hire vehicles for longer periods of time. Whether you need a truck for a few days or a full month, we can devise a rental package that is tailored to your exact requirements. With other hire companies, you’re typically required to return the rented vehicle back to a local rental yard – at your expense, once you have finished using the vehicle. At Mobile Truck Rental, we come and collect the vehicle from you at your new address, saving you time, travel costs and excess kilometres on your rental vehicle. To learn more about our long term hire servicess, please refer to our Long Term Deals page. Providing a AAA service means ensuring that our hire vehicles are in immaculate working condition at all times. To guarantee that our clients travel safely to their destination, our entire fleet is regularly serviced by trade qualified mechanics who perform full safety inspections. Avoid paying the extortionate fees to have a Gold Coast removalist transport your belongings by hiring a truck and doing it yourself. You’ll be saving yourself a bucket load of cash and our fully-featured hire trucks are decked out with everything you need to transfer your possessions with the utmost ease and efficiency. At Mobile Truck Rental, we do the collecting for you. We drop your hire truck off at your door step and we collect it from you, as soon as you’ve finished using it. It’s that easy. For a free quote, contact the friendly team at Mobile Truck Rental now!